"The IPDS (Intergalactic Pizza Devouring Squad) says 12 thumbs up!" Astronauts at the International Space Station posted pictures and a video over the weekend of their small, made-from-scratch pizza pies. The fixings flew up last month on a commercial supply ship, and the crew wasted little time pulling out the flatbread, tomato sauce, cheese, pepperoni, olives, olive oil and anchovy paste and pesto. After making their own individual-size pizzas, the six astronauts tossed and twirled them like floating Frisbees, before heating and devouring them. Commander Randy Bresnik called the pizzas "flying saucers of the edible kind." The crew, he said in a tweet, "had a blast channeling our inner chef by building tasty pizzas for movie night." "The IPDS (Intergalactic Pizza Devouring Squad) says 12 thumbs up!" Bresnik added. NASA's space station manager, Kirk Shireman, took pity on Italian astronaut Paolo Nespoli's pizza craving and, in mid-November, shipped up all the ingredients on an Orbital ATK capsule. 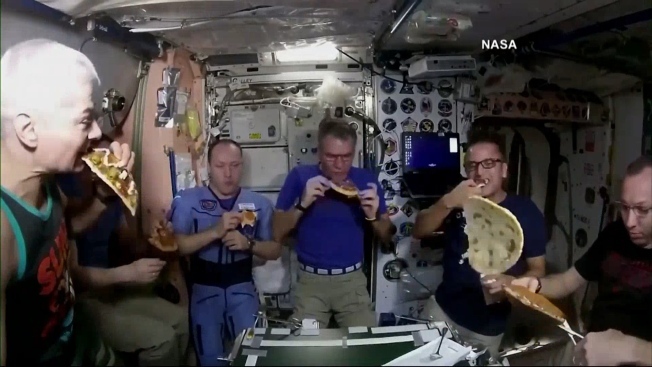 Nespoli, in orbit since July, declared the pizza "unexpectedly delicious." Nespoli has just over a week before returning to true Italian cuisine. He will land in Kazakhstan on Dec. 14, along with Bresnik and a Russian.